Taiwan is an island nation off the coast of mainland China, and is officially known as the Republic of China. Taiwan is made up of the islands of Taiwan (formerly Formosa), Penghu, Kinmen, Matsu, and various others. The capital of Taiwan is Taipei. Taiwan, officially the Republic of China, is an island nation, located off the coast of mainland China. 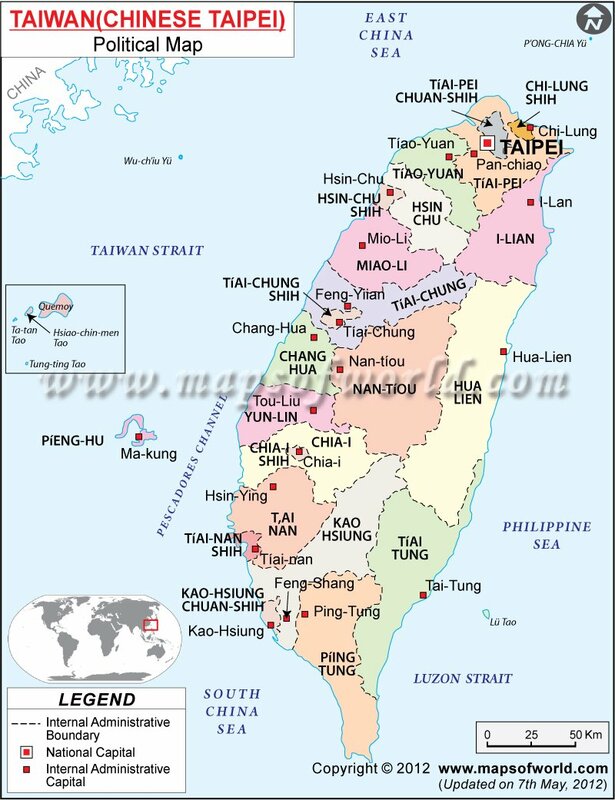 Taiwan consists of the main island of Taiwan, as well as smaller islands Penghu, Kinmen, Matsu, and others. The island of Taiwan used to be called Formosa. Nearest neighbors to Taiwan are the People's Republic of China (mainland China), Japan, and the Philippines. The capital of Taiwan is Taipei, while the largest city is called New Taipei City. Taiwan's government, the Republic of China, has a disputed status with the People's Republic of China, where each government has conflicting claims on the land of the other, uniting both China and Taiwan. Taiwan is divided into two provinces and five special municipalities. The provinces of Taiwan are Taiwan Province and Fujian Province. Within the provinces, there are provincial cities, Chiayi City, Hsinchu City, and Keelung City, and fourteen counties: Chiayi, Changhua, Hsinchu, Hualien, Miaoli, Nantou, Penghu, Pingtung, Taitung, Taoyuan, Yilan, Yunlin, Kinmen, and Lienchiang. The special municipalities of Taiwan are Kaohsiung City, New Taipei City, Taichung City, Tainan City, and Taipei City. The counties on the Taiwan Province are located on the main island of Taiwan, while the Fujian Province is made up of several smaller islands and archipelago, including Kinmen, Matsu Islands, and Penghu.